Classifying an employee as exempt from overtime is risky business these days. We often work with employers to help them assess whether a position falls within the exempt category under the state’s definitions in the Industrial Wage Orders or the federal Fair Labor Standards Act. We wish classification was a black and white call, but it often has grey thrown in. As a result, there are frequent court rulings on an employer’s actions in this area. Two important appellate court rulings have recently been published outlining more clarity around these exempt classifications. Under the CA state law, exempt employees must be paid a predetermined amount (at least two times the state minimum wage for full time employment) that is not subject to a reduction based on the quantity or quality of work. In the case of Negri v. Koning & Assoc., the plaintiff was an insurance adjuster who was classified as exempt and paid $29 per hour. He did not receive a flat or any guaranteed salary. However, he always worked at least 40 hours per week and often worked additional hours. He was also paid $29 per hour for each additional hour he worked overtime, not time-and-one-half as a non-exempt employee would be paid. The employee sued his employer alleging he should have been classified as non-exempt and received overtime pay as a non-exempt employee would have been paid. The trial court ruled in the employer’s favor stating that Mr. Negri was properly classified as exempt under the administrative exemption. The employee appealed to the CA Court of Appeal. The Appellate court reversed the decision in favor of the employee. Here’s the important part…. There are two prongs to defining whether an employee’s position is exempt – a job duties test and a salary test. The Appellate court did not address whether Negri was properly classified as exempt under the duties test. (There is a lot of history around the insurance adjuster classification that we’ll spare you the details of here.) However the court looked at the salary basis test. Although Mr. Negri’s paycheck was never less than 40 hours per week, he was still paid on an hourly basis and not a guaranteed predetermined amount. In essence he was paid hourly without a guaranteed minimum salary. As a result, if he had worked fewer than 40 hours in some weeks he would have been paid less and would not have a guaranteed minimum salary. The court ruled that’s a disqualifier for an exempt employee. So although Mr. Negri was eligible and did receive more pay for hours worked over 40 in a week, he was still not guaranteed the minimum salary of at least two times the state’s minimum wage. The court did note that it is ok to pay an exempt employee for working additional time without risking the exempt status, but there must be a guaranteed minimum salary. The full decision is here. Many managers are classified as exempt under the executive exemption under the CA and federal laws. One of the duties tests required to meet the executive exemption is that the employee must spend more than 50 percent of his/her time performing exempt level duties. There have been many cases in retail settings where individuals titled “manager” have been deemed to be non-exempt because they do not spend the a majority of their time in exempt duties, but spend time stocking shelves, ringing a cash register, waiting on customers, or preparing food and beverage. In the Heyen v. Safeway case, the plaintiff, a grocery store manager, argued that she spent the majority of her time doing non-exempt work such as ringing a cash register. The trial court found in the employee’s favor (determining that she did not meet the exempt duties test and should be classified as non-exempt) and awarded her overtime compensation. The employer appealed noting that the manager performed a number of exempt and non-exempt duties concurrently (such as managing the store while running the cash register.) 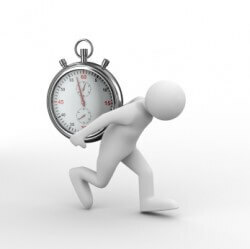 The Appellate court didn’t bite; they ruled in favor of the employee noting that time spent doing exempt and non-exempt work concurrently cannot count as exempt duties. The duties test must be based on the employee’s “primary purpose” of the work to determine which camp the work falls into – exempt or non-exempt. There is no partial credit given for mixed time. Both of these cases are a reminder to employers to review their pay and work assignments to employees classified as exempt. We encourage you to contact an attorney or HR consultant to discuss the nuances of these laws.